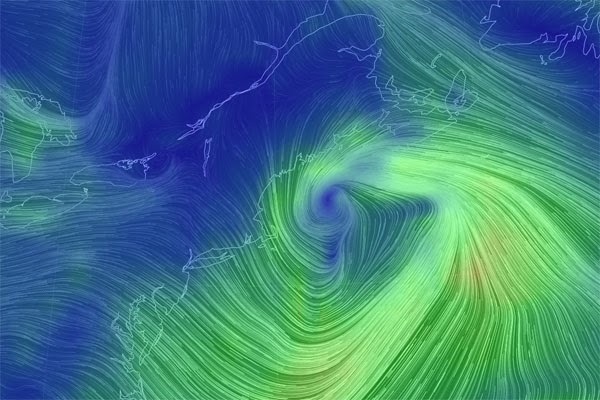 What are the best resources for keeping tabs on wind speeds throughout the region? Here are the online resources I use. This brand new global wind map depicts wind conditions for the entire planet. Just like in Google Earth, you can spin the planet and zoom in on whichever area interests you the most. Fascinating, hypnotic, and useful all at the same time. Snapshot of Northeast wind conditions, morning of 12/18/2013, from the Global Wind Map. For above-treeline wind conditions in New Hampshire, the go-to site (of course) is the Mount Washington Observatory, which has a great dashboard for current weather conditions, including a 24-hour wind history graph. They also provide a wind and weather higher summits forecast, which is essential reading for any peak-bagging attempt. The free NECN Weather App (for both Android and Apple, app name: NECN WX) has become my go-to source for weather info on both my smart phone and tablet. You can overlay current radar conditions on a zoom-able satellite map of anywhere in the country, as well as wind conditions, cloud cover, and more. Probably the most-used app on my phone.